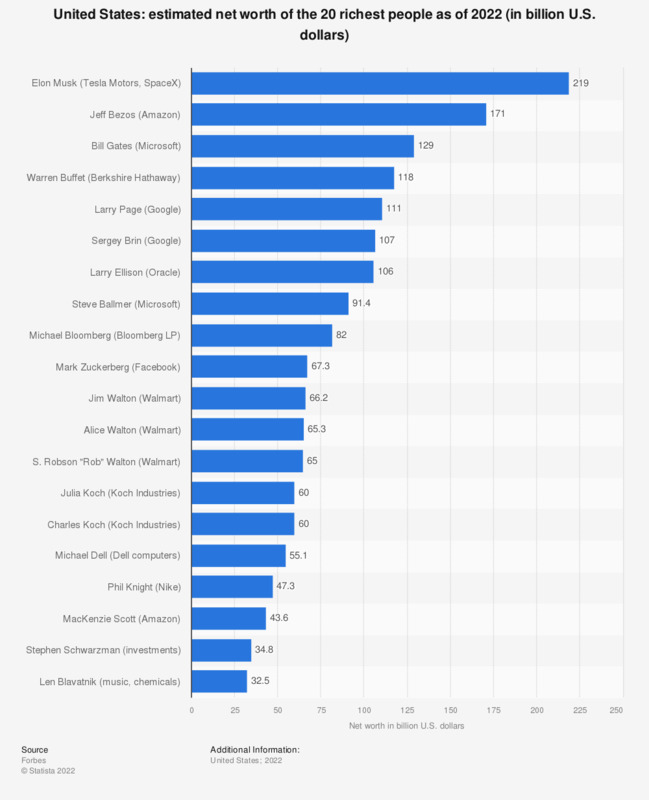 This statistic presents the estimated net worth of the 20 richest people in America as of 2019. At this time Jeff Bezos was the richest man in the United States with an estimated net worth of 131 billion U.S. dollars. Every year since 1982, the American business magazine Forbes has been compiling lists of the 400 richest people in the United States, known as the “Forbes 400.” In addition to that, since 1987, the publication has also been compiling a ranking of the 500 richest people in the world (excluding royalty and dictators), as well as more specialized tops, such as “World's Most Powerful Women,” “America's Richest Families,” “Most Valuable Brands” or “30 Under 30,” which focuses on young entrepreneurs from various fields which have gained millions in the past year by the use of social media, technical innovations and generally new and fresh approaches to business.